Vic O Threatened Don Jazzy: "I Will Drop A Diss Track If You Don't Work With Me"
A Nigerian rapper known by his stage name as Vic O has taken to the social media, threatening to drop a diss track that will bitterly surprise Don Jazzy if the veteran music producer and the boss of Supreme Mavins Dynasty, SMD refuses to work with him. The rapper, Vic O has not been in the music sphere for couple of times but right at the moment, it seems he is coming back through diss and shades. 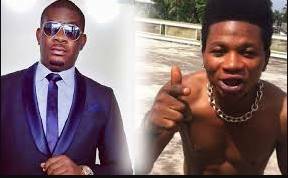 Vic O tweeted at Don Jazzy on Sunday, 6th of August 2017, making it known to him that he is a big fan and will like to work with the Mavins’ boss. Vic O therefore gave Don Jazzy a one-week ultimatum to give response to his tweets or else, he will drop a diss track that will basically targets the records producer. Up till now, Don Jazzy hasn’t reply Vic O’s tweets and the rapper, Vico is counting down the days already. According to Vico on Sunday, he tweeted that Don Jazzy have 6 days left. far, Don Jazzy is yet to reply and Vico is counting down already. Six days left.